Combine all the ingredients and smother! Reserve a portion of the sauce if you like dipping sauce. 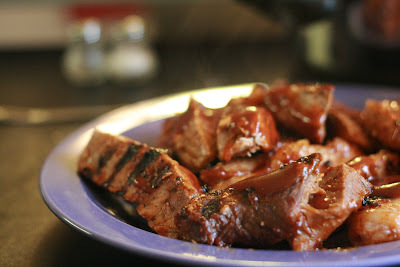 *I was making ribs one day and decided that just BBQ sauce or steak sauce was too boring. So, I made up my own version that had more depth. This can be used on a variety of meats (steak, chicken, pork). mmm sounds yummy! what is liquid smoke, and how do I get it? Oh man! Johnny is going to LOVE this! lol He loves Ribs and this would make a great date night dinner. BTW- Trey takes awesome pics- tell him good job and hi for us! Thanks for sharing! Liquid smoke is found in most grocery stores. It generally comes in small bottles and comes in a variety of wood flavors. Have fun playing with this recipe. If you like the flavor of one thing over another then add more. Oh, yum! Now I've got to get some liquid smoke. Nice photos, too!